A bedroom bench can be is ideal for your bedroom to get extra space to sit. It normally doesn’t look like a regular sofa and brings style to your bedroom. The traditional bedroom benches give a classic look to bedrooms and there are many of the benches with storage space to store your accessories. The Ariel Storage Bench symbolizes both style and practicality. This luxurious bench comes with a storage compartment for keeping your belongings. Crafted from wood, this sturdy and durable bench is long lasting. It features beautiful white finish that will enhance and brighten up your bedroom interior. Under its flip top, there is ample storage space for stashing your throws, blankets, cushions and their covers. A built in wood serving tray further adds to its functionality. The seat is generously padded with fire resistant polyurethane foam for comfortable seating experience. This stylish bench is upholstered in leatherette for a sleek and high profile look. Bracket styled legs not only support the bench frame but also create a stylish look. You can remove the legs for a low profile look. Another plus point of this elegant and easy to care bedroom bench is that it is very simple to put together. Other materials used in construction are leatherette and flame retardant polyurethane foam. Lusciously padded with flame retardant foam. Has seating capacity for one person. Felt-lined storage compartment comes with a built-in wood serving tray. Requires minimal assembly. Only the feet needed to be attached. Comfortable and stylish is how this sophisticated Henderson Upholstered Storage Bedroom Bench should be defined. Combination of mocha colored fabric with nail head trim accents in antique brass finish will create a visual delight in your bedroom interior. This bedroom bench is tufted artistically for a great look. It is very cozy because of luscious foam padding to offer you a relaxing seating experience. The flip top lid opens up to reveal a hidden storage space below the seat. You can keep your blanket, pillows or bed cushions in the storage compartment. This gorgeous piece will be an excellent choice for its style and functionality. Upholstered Storage Bedroom Bench Collection. Upholstered with polyester/polyester blended fabric. Beautifully tufted and accentuated with nail head trim. Storage compartment below the seat. Comes with a flip top lid. Straight feet with brown finish. Maximum weight capacity: 125 lbs. Create a pleasing seating area in your bedroom, entryway, hallway or living room with the elegant Linon Claire Print Upholstered Bench. This bench features a sturdy Birchwood construction and a comfortable seat which is generously padded with fire resistant foam. Fire resistant foam filling made this bench a safe choice for homes. One of the best eye-catching aspect of this bench is its spindle shaped stylish legs. The black legs match with the beautiful print of the upholstery. With its lovely butterfly printed fabric, this traditional styled bench will prove to be a smart choice for any bedroom décor. It can be good as both bedroom bench or entryway bench. Materials used in making this sturdy bench are Birchwood, CA fire foam and printed fabric. Luxuriously foam padded seat is very comfortable. Upholstered in beautiful butterfly printed fabric. This bench is also available in Damascus fabric which has a burgundy colored background. It has seating capacity for two people. Graceful spindle legs in black finish. 6 months limited warranty provided by Manufacturer. Product care: Wipe clean this bench with a damp cloth. Provide your friends and family with a comfortable seating solution while keeping you clutter free with stylish Elk Valley Upholstered Storage Bedroom Bench. Your friends and family are going to fall in love with this stunning beauty. The versatile Sahara Storage Bench will set off your bedroom décor with its myriad of details. This multipurpose bench features a high performance and easy to care fabric with rich espresso finished feet that create a timeless and sophisticated look. It comes with a fully lined storage compartment with slam proof hinges in black finish. The storage space allows you to keep you extra pillows, household linens and virtually anything you want. The bench is a practical solution to keep your room organized while offering extra seating area to your unexpected guests. Elk Valley Storage Bedroom Bench Collection. Bench frame is manufactured from sturdy and eco-friendly wood. This multi-purpose bench can be used in kitchen, entryway or bedroom. Attractive block feet are made from solid wood. Feet features a rich espresso finish. Bench is fully upholstered in high performance and easy care fabric. Upholstery material is a blend of cotton and polyester/polyester. One storage compartment below the seat for storing extra items. Interior compartment is fully lined. Includes a lid that has a slam proof safety hinge. Assembly and installation not required. Attractive and traditional look of the stunning HomePop Microsuede Storage Bench will prove to be a wonderful addition to your home decor. This bench is robust, sturdy and long lasting. Generously foam filled and upholstered seat is very comfortable. Beautiful microsuede fiber upholstery is tufted for a luxurious look. The bench reveals a flip top storage compartment underneath the seat. You can keep your pillows, blankets, bed sheets and pillow covers in to the storage compartment. This versatile bench can easily accommodate two people. Bring home this storage bench and convert empty space of your bedroom, living room or entryway to a functional area. The HomePop Microsuede Storage Bench will not disappoint you. Manufactured from solid wood and particle wood frame. Also comes in Lush Slate finish which is grey in color. Upholstered and tufted with matching buttons. Seating capacity for two people. Includes a hinged lid that comes with slow close hinges. One storage compartment below the seat where you can store your less used items. This bench is very easy and simple to assemble and needs assembly. The traditional look and elegance of Fitchburg Tufted Upholstered Polyester Bedroom Bench will be a valuable addition to any traditional bedroom décor. This gorgeous bedroom bench features a fully upholstered frame that is embellished with handcrafted diamond tufts. Linen and viscose upholstery with beautiful turned legs exude an air of sophistication. These delicate turned legs can be easily removed when needed. This bedroom bench is a perfect style statement for any bedroom. Manufactured from FSC certified and robust wood. Color: Talc. Refers to powder white color. Also available in these colors: Black, Charcoal, Chocolate, Coral, French Yellow, Grey, Laguna, Linen Smokey Quartz, Navy, Parchment and Sandstone. Upholstered and tufted with diamond tufts for a beautiful look. Upholstery fabric is 55% linen and 45% viscose. Turned legs enhance the overall style with elegance. Legs are of dark brown color. Black upholstered bench has matching black legs while all other benches come with brown colored legs. Skyline Furniture provides one year limited warranty. Product care: This bench should be spot cleaned only. If you are looking for a cozy and sturdy bench, your search ends here! The Coast to Coast Imports Two Seat Bench is a perfect choice for you. It is comfortable and stylish. This gorgeous bench can be placed in any room of your modern home décor including bedroom, living room or entryway. 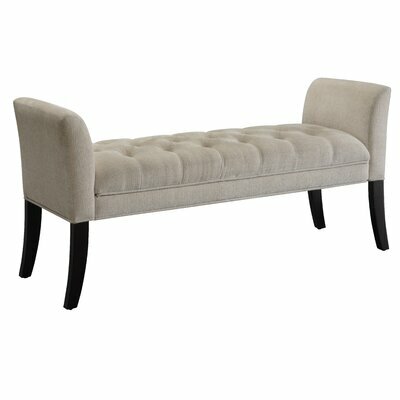 The elegant Two Seat Bench is upholstered in microfiber and is tufted for a great look. Ecru-beige upholstery with espresso finished tapered legs reflect a delightful appearance which is very pleasing to the eyes. The microfiber upholstery is quite easy to maintain. The tapered legs not only support the bench but also give it a unique and stylish look. Arms allow you to rest on it in a relaxing posture while rendering the bench a graceful touch. It is a bedroom bench. The bench features solid pattern. Seat of the bench is upholstered and tufted. It includes arms and legs. 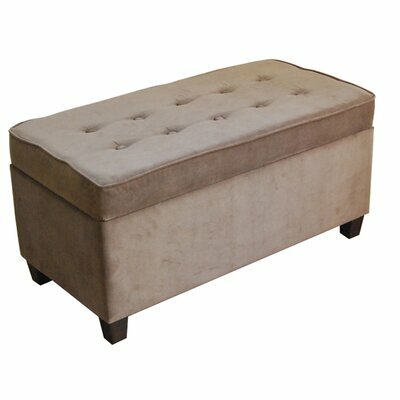 The marvelous Cooper Skirted Bedroom Storage Ottoman by House of Hampton is elegant and apt for any bedroom theme. It sports a stylish skirted design for a cosmopolitan look. 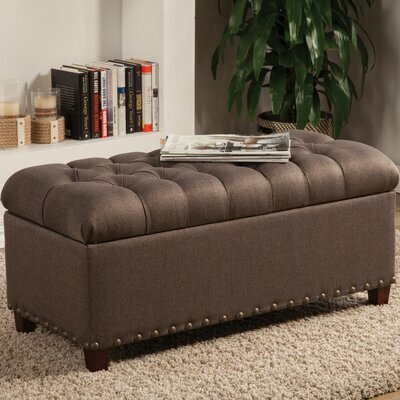 This ottoman features solid pine construction with hardwood legs, 100% microfiber polyester upholstery and tufted cushion. 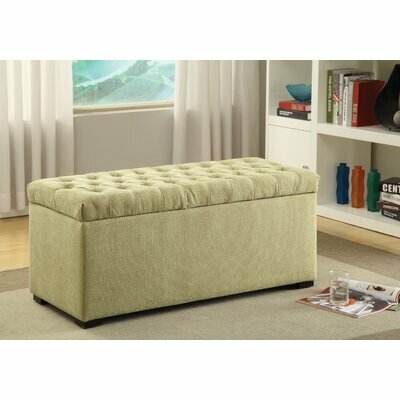 Luscious polyurethane foam padding makes this ottoman very comfortable for a relaxing seating experience. A spacious storage compartment is under its cushion where you can keep your extra sheets and pillows or other knick knacks. It also has a removable lid. This gorgeous bedroom ottoman is available in a wide array of colors that allow you to choose the one that suits your taste or matches with your bedroom theme. 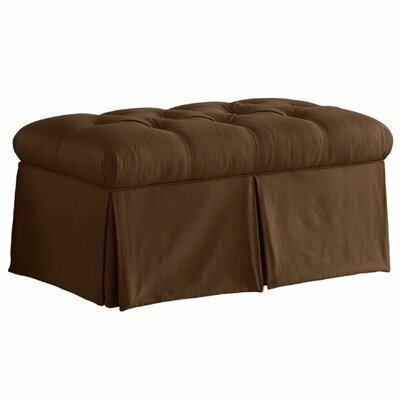 Cooper Skirted Storage Ottoman Collection. Bench frame is manufactured from FSC certified and eco-friendly solid pine while legs are crafted from hardwood. Also available in black, silver, Aztec, chocolate, khaki, parchment, woodrose. Cushion of the seat is lusciously padded with polyurethane foam. Upholstered in 100% Microdenier polyester. Features a stylish skirted design. One flip top storage compartment under the seat. This bench does not require assembly. It is one unit and ready to use. One year limited product warranty is provided by Manufacturer for this product excluding fabric. Enhance the elegance of your room décor with the classy Lenore Aline Upholstered Entryway Storage Bench. It symbolizes a perfect blend of sturdiness, style and comfort. Easy to maintain microfiber upholstery with generous foam padding and button tufts give it a luxurious appearance. The bottom border of the bench is embellished with antique gold finished nail head trim. Dark brown upholstery with cherry finished cabriole legs add to its overall charm. Lenore Aline Storage Bench Collection. It is an entryway bench with seating capacity for two people. Color of Upholstery: Dark Brown. Finish of the legs: Cherry. Upholstered in microfiber which is very easy to maintain. Tufted with button tufts that add elegance. Bottom border is accented with nail head trim in antique gold finish. Wooden legs are carved and features a dark stained finish. Design of legs: Cabriole legs. Storage compartment under the seat of the bench provides ample space for storage. 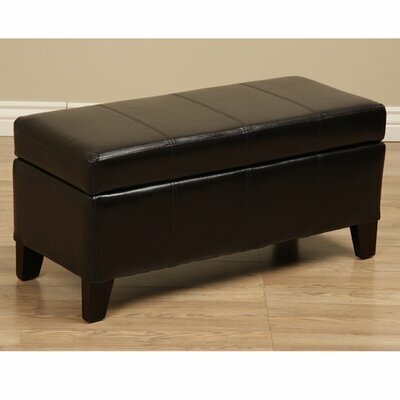 Simple and elegant appearance of the Home Loft Concept Jesus Bonded Leather Storage Ottoman Bench will blend beautifully with any room décor. It is graceful and functional with a hidden interior storage space underneath the seat. This storage space allows you to keep your bed linens, pillows and their covers organized while keeping your bedroom clutter free. Hardwood construction renders sturdiness with endurance to this lovely ottoman bench. Leather upholstery and a smooth top give a classy look that goes well with its contemporary style. 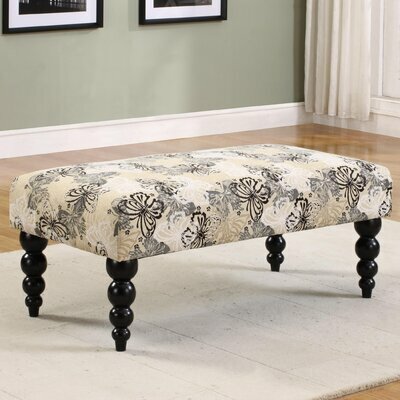 You can place this gorgeous ottoman bench in your foyer, living room or bedroom as extra seating and storing solution. 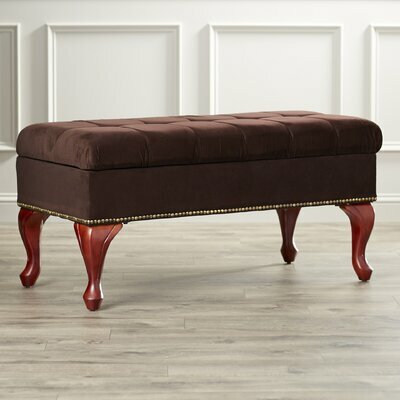 Bailey Storage Ottoman Bench Collection. 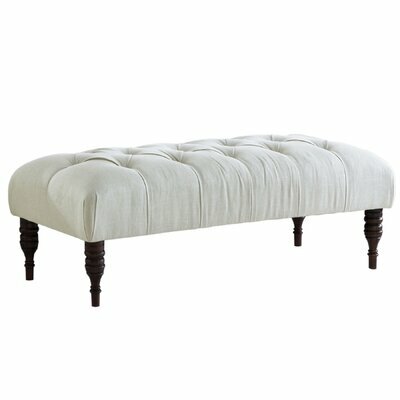 This is a bedroom ottoman bench. It is also ideal for foyers and large living rooms. It is also available in red finish. Darkly stained feet support the bench. It comes with a flip top storage compartment under the seat. The storage compartment provide ample space for keeping your stuff. Requires assembly and very simple to put together. This product comes with 90 day warranty against manufacturing defects.